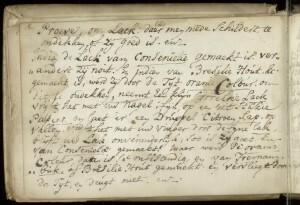 On this blog we tend to hear a lot about English household manuscript recipes but lively traditions existed elsewhere, as Sietske Fransen and Saskia Klerk also show in their series on a Dutch manuscript of recipes. 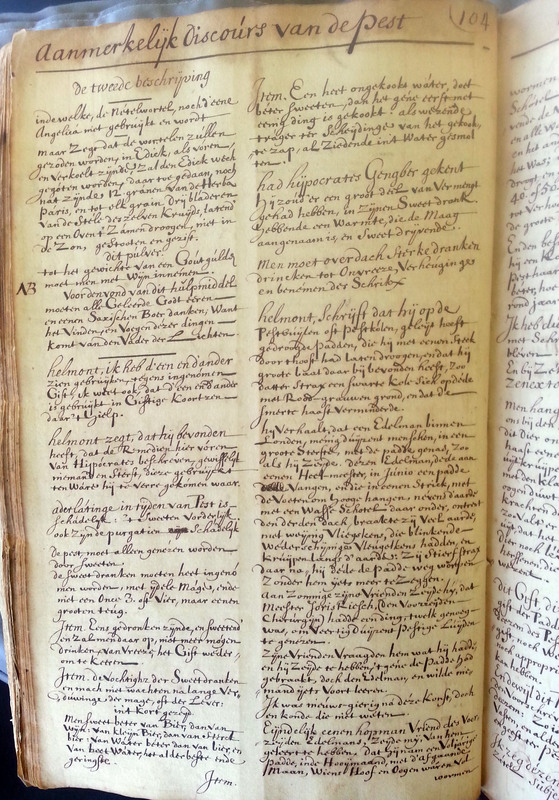 In my own search for eighteenth-century Dutch medical and chemical recipes, I often come across manuscript recipe books that lack a detailed catalogue description, so I have to check them page-by-page to see if there is anything relevant for my current research. Often these recipe books have little to do with medicine or chemistry, or they contain only a limited number of medical home remedies. Yet this does not make these books any less interesting to researchers. This week, when I opened a manuscript at Museum Boerhaave (inventory number BOERH a 176) which was marked in the catalogue as ‘medicine book and recipes, before 1860’, I caught a fascinating glimpse of early modern upper class life. 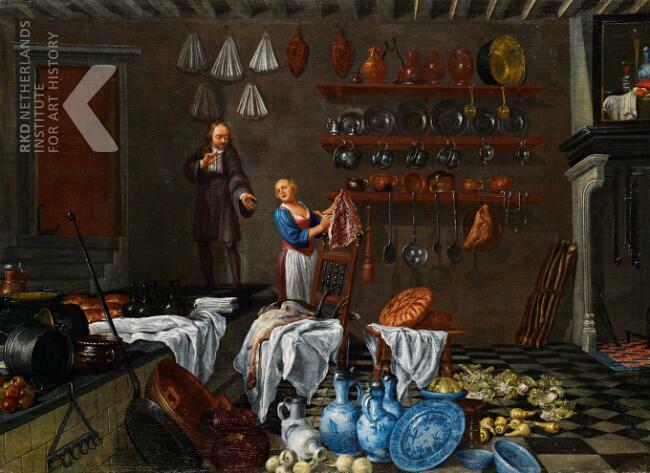 Kitchen interior, oil on canvas, Dutch, anonymous, second half of 17th C. Courtesy of RKD images. Judging by the spelling and state of the paper, my guess is that this manuscript is quite a bit older than ‘before 1860’, it dates probably from the eighteenth or maybe even the seventeenth century. This is supported by the fact that underneath one of the recipes someone has noted in a different hand ‘1721: selfs geprobeerd’ (‘tried myself’). The cover and a number of pages are missing, but it contains a wealth of recipes for food, human and veterinary medicine, household chores, and home decorations. As many of the cookery recipes list expensive ingredients spices and lemons, and as the book also contains recipes for gilding, ink, paints, wax fruit, and a special recipe for nightingale food, it seems most likely that the recipes were collected in an upper class household, like that of an aristocratic or well-off merchant family. Unfortunately the manuscript is anonymous, and the few names that are mentioned give little direction either. The only names mentioned are a certain mister Plaatman as the source of a recipe against kidney stones, and with a recipe for a potion, the author has noted ‘bij Susanna ghebruijckt in haer siekte’ (‘used with Susanna in her illness’). Given the distinct upper class feel of the recipes, and that fact that they are written in high Dutch in seventeenth and/or eighteenth century, the first Susanna that springs to mind is Susanna Huygens (1637-1725), daughter of Constantijn. Of course there must have been more women named Susanna, but the population of the United Provinces around 1800 was small – roughly 2 million people – and the upper class thus too, so it would be interesting to see if additional research can confirm this surmise. 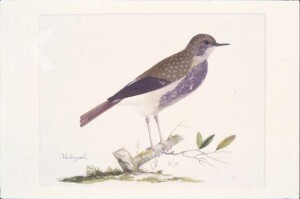 Pieter Holsteyn I, Nightingale, crayon and gouache on paper, ca. 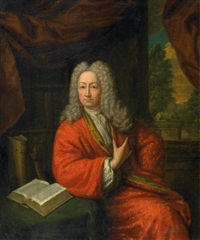 1656-1667. Courtesy of RKD Images. Van Helmont on the Plague, Again! A few weeks ago Saskia Klerk introduced the Leiden manuscript BPL 3603 to the readers of this blog. This recently acquired manuscript has a pencil-written remark on the flyleaf by a modern cataloguer with the inscription ‘Van Helmond’s Recepten’. We can safely assume that this refers to the seventeenth-century physician Jan Baptista van Helmont (1579-1644) and/or his son Franciscus Mercurius (1614-1698). 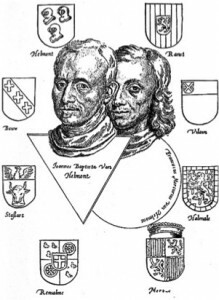 Father and Son van Helmont, frontispiece in Dageraed, Amsterdam 1659. When Saskia told me about it for the first time, I was very curious to learn more. As there is very little known about the reception of Jan Baptista van Helmont’s Dutch work Dageraed (‘Daybreak’, Amsterdam 1659), this recipe book in Dutch might well shed more light on this part of the Helmontian story. And secondly, I had the faint hope that Saskia might have found some of the now lost manuscripts by Van Helmont himself. Unfortunately the latter is not the case, but I am very sure that the manuscript will tell us more about the reception of Van Helmont’s Dageraed, as well as about medical practices in the Low Countries in general. In two previous blog posts (see here and here) I wrote about Van Helmont’s treatise on the plague and his recipes for sweat potions. These recipes were good examples to show the differences in translation practices between the ingredients (heavily based on Latin terminology) and the performative parts of the recipes (firmly grounded in the vernacular tradition). Not unsurprisingly – since these are the only recipes in Van Helmont’s texts that were published as visually recognisable recipes (with lists of ingredients, followed by the actions) – these recipes are copied into BPL 3603. The picture here shows how the compiler of the manuscript ordered the ingredients in such a way that we find the Latin names in the left column and the Dutch equivalences on the right. All terms and additions are taken verbatim from Van Helmont’s Dageraed, which implies that the compiler had seen a copy of this book. At this point it is unclear to us whether this Dutch recipe collector was a physician, or an apothecary, or whether BPL 3606 was a household book, or perhaps it was a combination of all of this. We hope to find out more in the future. The compiler did not only copy the recipe, but also several other passages from the plague treatise. 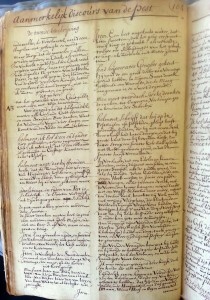 Van Helmont’s treatise on the plague forms the second part of the Dageraed. The first part of the book gives an overview of his medical philosophy, from the influence of the heavenly bodies to his theory of disease, whereas the second part concentrates on one disease (the plague) and its history, causes, and treatments. The compiler of BPL 3603 seems especially interested in copying passages in which Van Helmont displays his experience. The compiler quotes Van Helmont, for example, as a proof for his understanding that only sulphur (‘swavel’) can protect one from the plague. Van Helmont tells of the example of a regiment of soldiers which he observed nearby Sas van Gent. The regiment consisting of Neapolitans, as well as Walloons and Germans died almost entirely from the plague, apart from the Germans. According to van Helmont, the Germans had used gun powder (‘bospoeder’) on their clothes to protect themselves from lice. 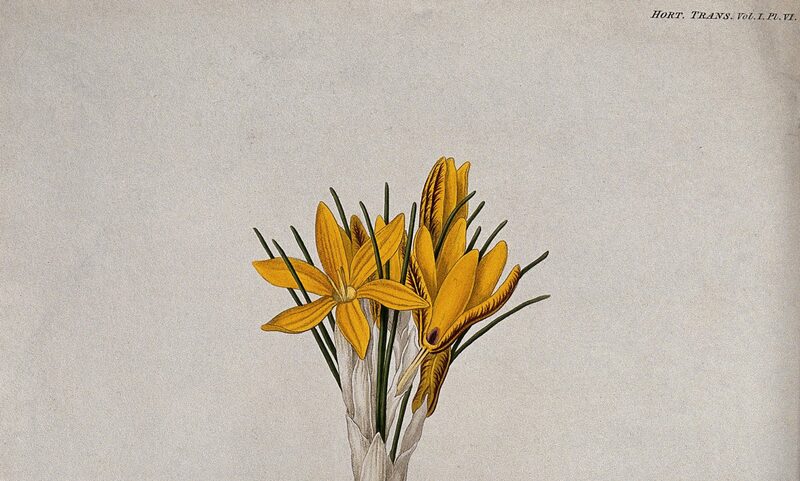 Subsequently, very few of them died, which Van Helmont saw as a result of the qualities of sulphur. University Library Leiden, MS BPL 3603, p. 104: the author quotes Van Helmont. 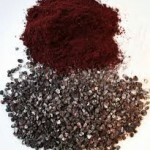 The compiler uses the extracts from the Dageraed here to prove the effectiveness of sulphur as a treatment. This resonates with extracts and quotes of Van Helmont that the compiler adds two pages later. Also here the main concern seems proof for the usefulness and effectiveness of the discussed drugs: ‘Van Helmont says he has seen it been used effectively’, ‘Van Helmont says that no one will die from using these drugs’, etc. Van Helmont’s comments and the way the compiler is quoting and naming Van Helmont make clear that Van Helmont is used as an authority. The compiler seems to be very interested in the practical applications of the drugs, much in contrast to Van Helmont, who always embeds his practices into a theoretical framework. This might point to the motifs of collecting for the compiler. In the next blog post Saskia will start to look into the references to Johan van Beverwijck in the BPL 3603. Will she find a similar interest in proof and personal experience by the compiler when quoting Van Beverwijck or does his interest lie somewhere else? For a brief account on the lost Helmontian manuscripts, see Antonio Clericuzio, ‘From van Helmont to Boyle. A Study of the Transmission of Helmontian Chemical and Medical Theories in Seventeenth-Century England’, The British Journal for the History of Science 26, p. 311-12.